Jaramillo never sniffed the major leagues, and probably never would have with the Phillies. Last year for AAA Lehigh Valley, Jaramillo hit .266 with 8 HR and 39 RBI. 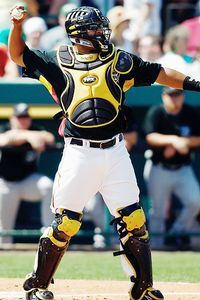 Paulino, 27, the Pirates starter in 2006 and ’07, hit .212 with 2 HR and 18 RBI in just 40 games for the Buccos in 2008. In 2006, Paulino hit .310 in 129 games for Pittsburgh. Thoughts: This caught me off guard, considering all the Mark DeRosa talk switched to Jaramillo going to San Diego. Now all bets are off. As far as Phillie catching depth, Chris Coste could be on the way out; of course, he could also be shuffled into a right-handed bat bench player, devoid of any catching duties. But any way you slice it, Paulino is clearly the No. 2 guy going into Spring Training. What about Lou Marson? The hot prospect catcher suddenly moves down the depth chart with Paulino’s arrival. Is Marson more of a trading chip now? Hard to say. I wonder why the Phils added a major league player to a position with so much depth across the board. Certainly there are alterior motives fueling Ruben Amaro Jr.